Hello friends! 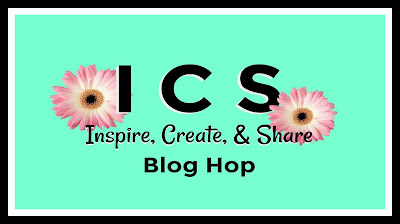 I am so excited for the Inspire, Create, & Share Blog Hop tonight. We have all sorts of wonderful Christmas card designs to share with you. 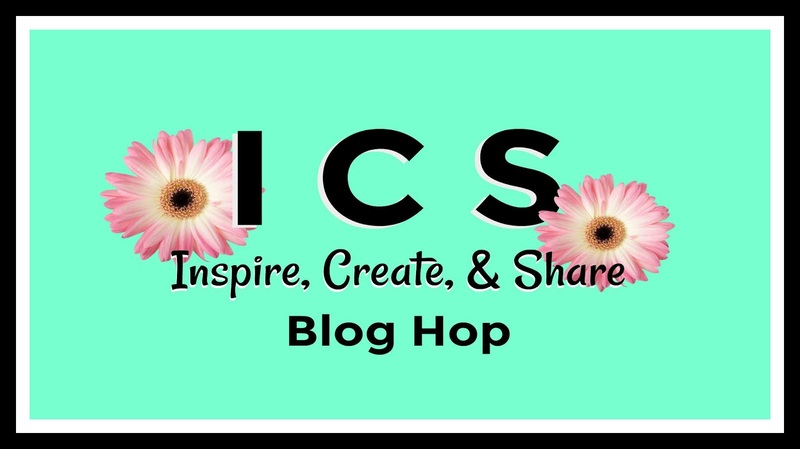 I hope you enjoy every blog creation! 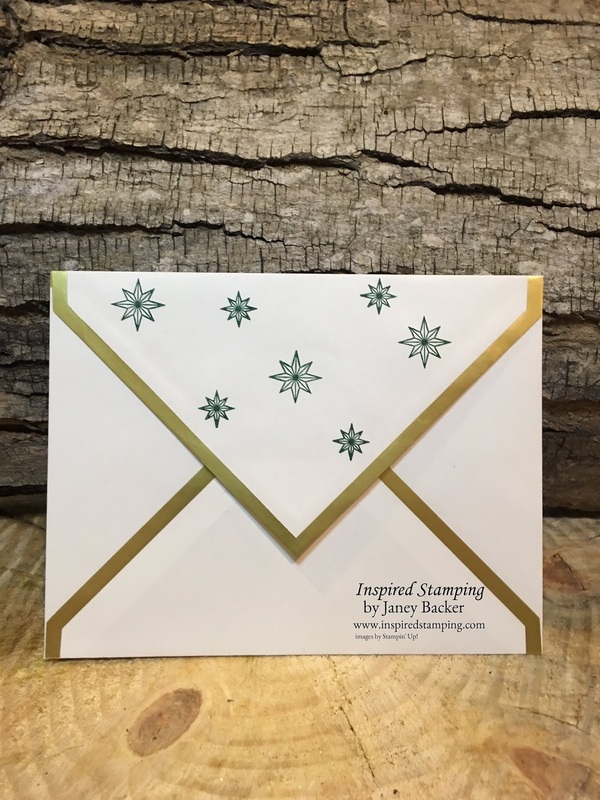 My card features the Star of Light stamp set and Starlight framelits on our Gold Foil-Edged card and envelopes. 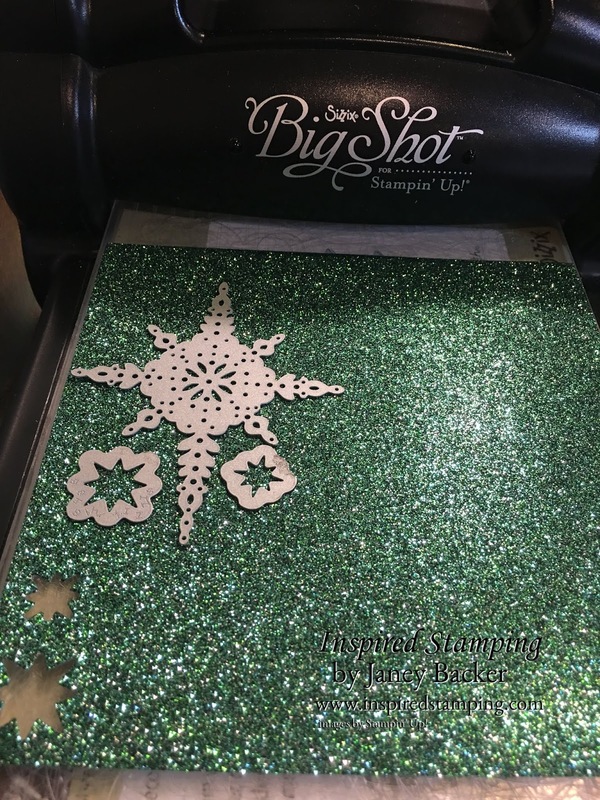 All of the stars on the card front are die cut from the green Joyous Noel Glimmer paper. 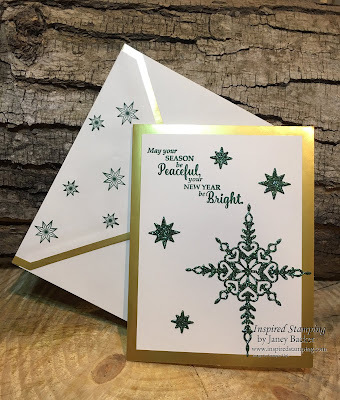 This card is elegant with sparkly elements! I used the Mulitpurpose Adhesive Sheets on the back of the glimmer paper, card stock, and gold foil paper. 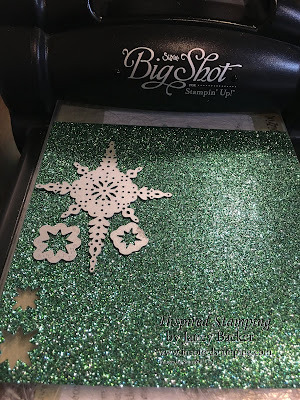 Then I die cut the stars from the green Joyous Noel Glimmer Paper. 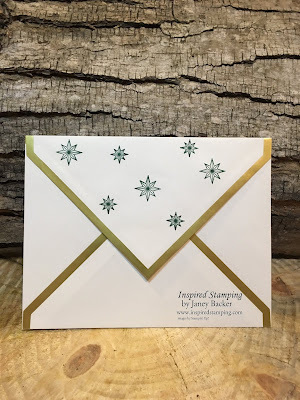 The foil edged envelopes are so glamorous, stamping the back gives it perfect coordination! Isn't this elegant? 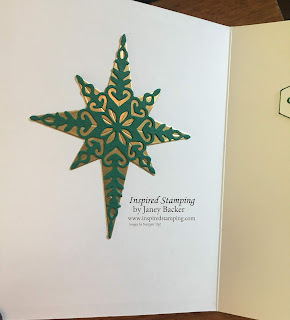 I layered a Shaded Spruce card stock die cut star onto a Gold Foil paper die cut star and placed it on the interior of the card. 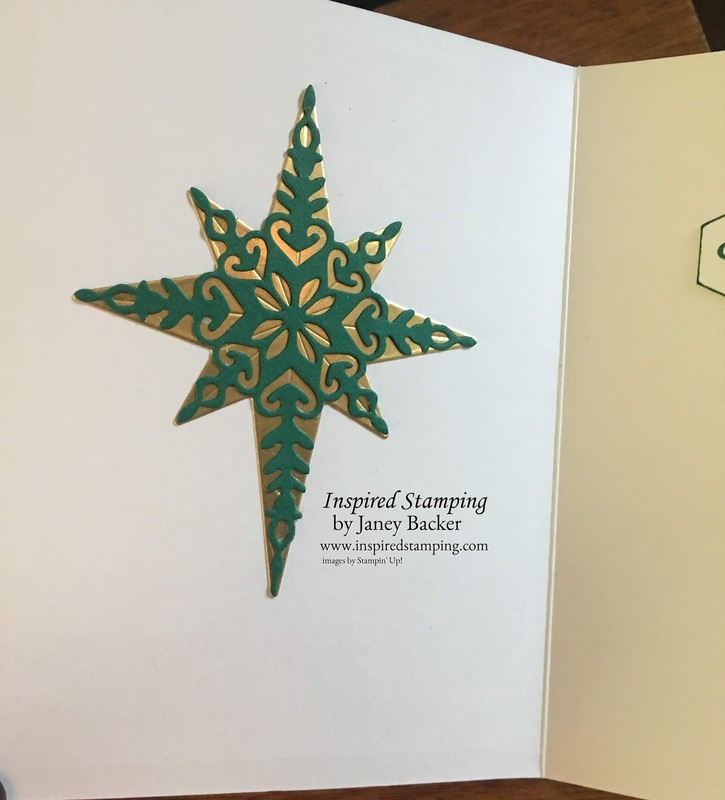 I love how the gold shines around all of the intricate shapes on the Shaded Spruce star. 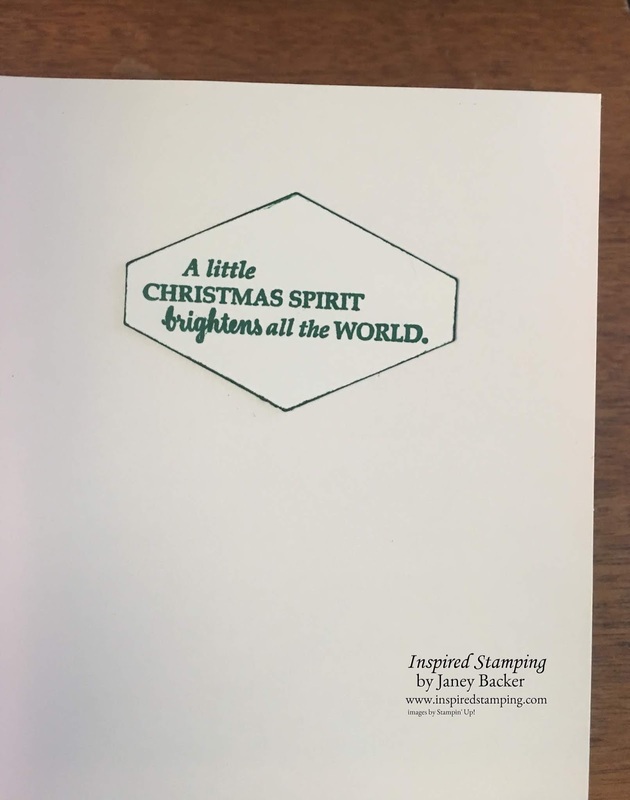 The interior sentiment was stamped in Shaded Spruce and then punched out with the Tailored Tag punch. I colored the edges with a Sponge Dauber tapped into my Shaded Spruce Stampin' Pad. All of the products for my project are listed at the end of this post. I hope this design inspires you to make a few more Christmas cards to send out this month! Join me to hop over to see Shirley's Christmas card creation next, click on the Next button below. Our Year-End Closeout will start on December 5th around 3am MT and products are while supplies last. Don't miss out, shop early for the best selection of your favorite products. Read and/or print the list here. 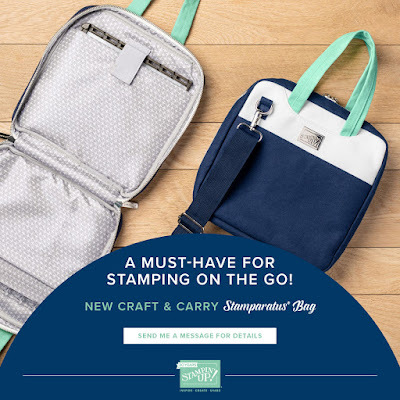 Starting December 5th you can order this beautiful and sturdy Craft and Carry Stamparatus Bag! See details here, starting December 5th. *edited to add: more bags arriving December 10th. Please contact me or your demonstrator with any questions. 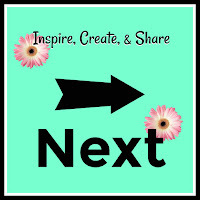 If you don't have a demonstrator, then I am happy to help you get started with an order. My online store is open 24 hours at http://bit.ly/shopwithJaney. Orders over $50 will receive the November IDEAS tutorial bundle. Please use the November Host Code when you order is less than $150. Host code closes on December 28th. 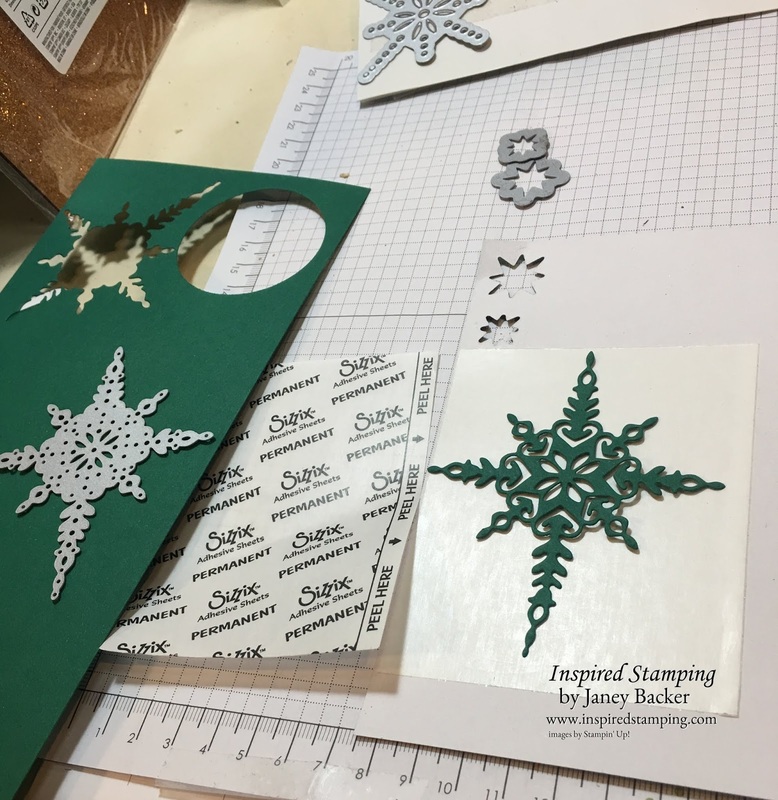 Orders of $150 or more do not need the Host Code and will earn their own Stampin' Rewards and the December IDEAS tutorial bundle.